Welcome to HowTheyAsked.com—the site with more than 17,000 real marriage proposal ideas from couples around the world. 1) Proposal idea generator: Search through thousands of real proposal ideas. 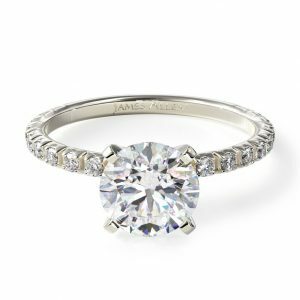 2) Check out Blue Nile’s recently purchased engagement rings or James Allen’s ready to ship engagement rings for inspiration on creating your own ring. 3) Look through all our proposal planning content and tools. 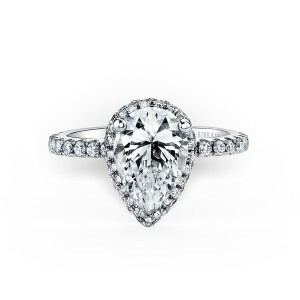 4) Insure your engagement ring: Most jewelers recommend it, but a lot of couples overlook this step. We did a deep dive on how to get the right insurance for you. A truly great marriage proposal can be very hard to think of. You want to be original, but you don’t want to overdo it. You want your partner to say yes (and cry a lot). Keep in mind: Every proposal will be unique if you put all the unique details of your relationship into it. These next few marriage proposal ideas can get be perfect for couples with a ton of history, great stories and lots of memories. Think of a few places that are meaningful to your relationship and send your partner (and two to three friends or family members) to visit these places. Throw in a salon appointment (hair and nails), and perhaps even a stop at a boutique to pick out a new outfit. Along the way, have notes or cards (or even a voice recording of yourself) describing what each place or stop signifies. At the end of the scavenger hunt, propose with a romantic view in the background and have all the friends and family members involved in planning the day there to celebrate after. Here’s an amazing example (it’s one of our most-read proposals). They stopped by places that were significant to the couple’s relationship, as well as places that Megan could get pampered and dolled up before the proposal. After the day was over, the getting down on one knee part was ultimately done in private (a great strategy), but it was still captured from a distance on camera! Make sure you hire a photographer when you propose—it’s one of the more important parts of planning your proposal. 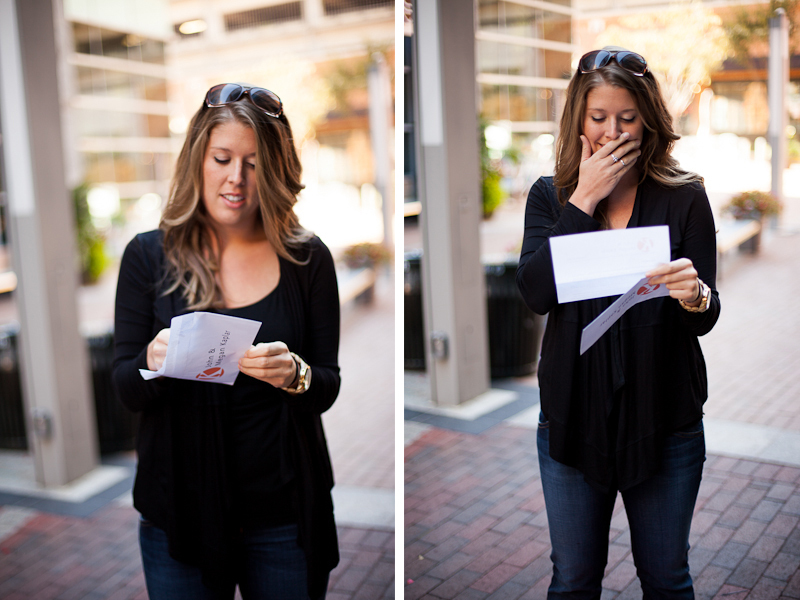 You can see more scavenger hunt proposal ideas here. We’re huge fans of outdoor proposal ideas. After all, relationships are about experiences, the journey and adventure. If you and your partner enjoy a good hike, outdoor picnic, or extreme adventure, here are a few unique marriage proposal ideas to learn from. When you spend a lot of time planning a proposal, you want to make sure to remember every detail of the big day. 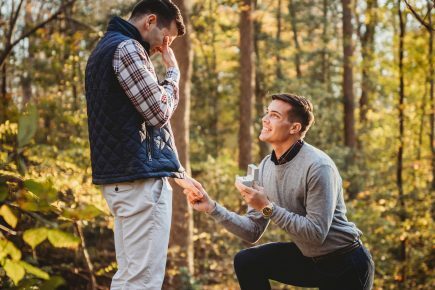 Sure, you could set up a tripod and hope the self-timer on your phone catches the moment, but if you want the best pictures possible, a surprise photoshoot proposal is the way to go — like Javier and Michael’s proposal. Here are some of our tips on how to plan the perfect photoshoot proposal. 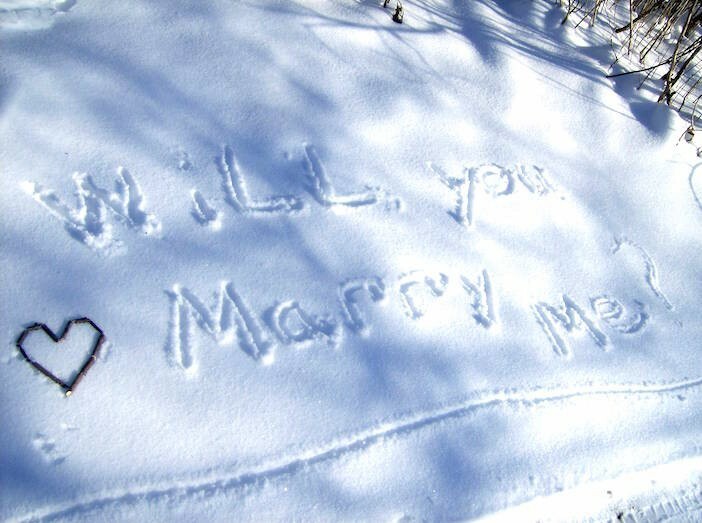 Write different phrases in the snow that are visible to you and your partner as you’re going up the ski lift (you can put love quotes, write out dates/milestones from your relationship, or scribble some nicknames in the snow). Here are more snowy proposal and winter proposal ideas. What better place to propose than at the end of the trail? It’s symbolic of your journey, and chances are, the view at the top will be breathtaking—like this amazing proposal at the Stairway to Heaven. If you’re a big fan of the ocean, the beach could be the perfect place to propose. Tell your partner that you heard of a beach contest for the best sand drawing (to enter, you’re supposed to take a picture of it and email it in). You could even ask the lifeguard to come up to you and “tell you about the competition.” Suggest that both you and your partner should create your own drawings. Of course, you’ll use this as your time to write out the marriage proposal. When you’re both finished, share your creations—they’ll be stunned. See more beach proposal ideas. Books or photo albums are a great way to chronicle your own relationship and have a keepsake to hold onto for the rest of your lives. Having your partner read through something before you get down on one knee is also a great way to build up all the emotion. With video creation being easier than ever (you can even use your smartphone to shoot it! ), we’ve seen some really cute videos being compiled and shown right before the proposal. There are movie trailer proposals, Disney montages and tons of others. One of our favorite marriage proposal ideas is recording a video of you at all the places that are meaningful to your relationship. Record yourself at the park you laid in for five hours on a Tuesday evening, the restaurant you went to with her parents for the first time, the pet store you got your bulldog from — tell her why these moments were so special to you and your relationship. You can show this movie at home (before the TV show you’re both hooked on), in front of friends and family members at a surprise dinner or event, or see if you can show the video at your local movie theater. 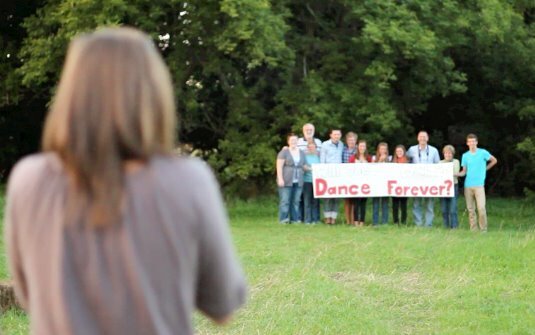 This unique marriage proposal ensures you have the memory for years and years to come. If you’ve got a book lover on your hands, ask the author of their favorite book to sign “Will You Marry, ____ (your name)” on the inside. Take your partner to dinner or a picnic and give the book as a gift. You can even carve out the book and put the ring in the middle. Not only is this a creative way to propose, but it’s extra special because you’ll have the signed book as a physical memory of the proposal forever. Take photos and keepsakes from your relationship and make a photo album or story book out of it. Make sure to include feelings you had with each memory and a note on the last page that says, “Will you marry me?” A bonus idea would be to add an additional page to the story book with photos and emotions from the marriage proposal (after they say yes, of course!). 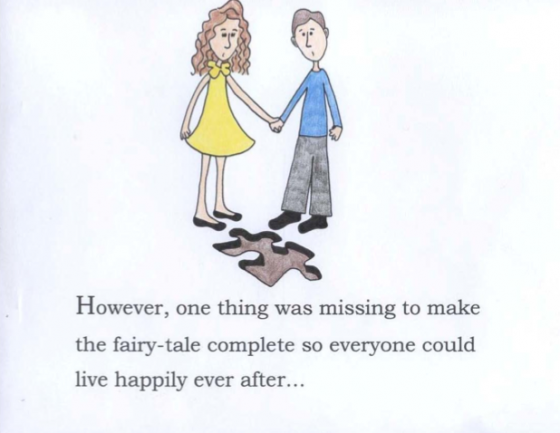 Here are some great letter and/or scrapbook proposal ideas. 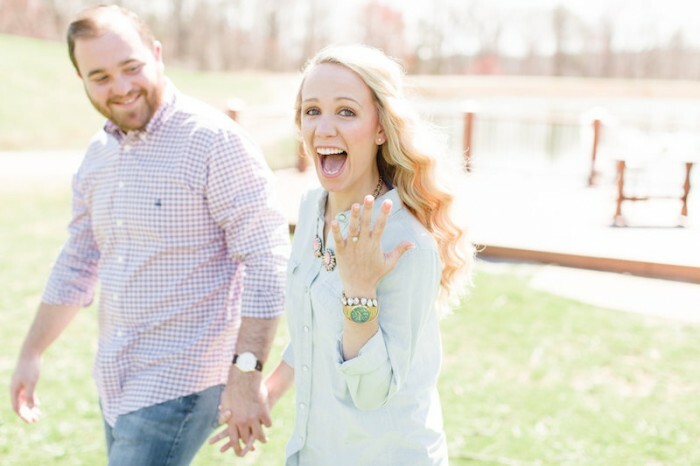 Here are a handful of proposal ideas with friends and family. Plan a game night alone or with friends. When it’s your partner’s turn to answer a question, head over to where they’re sitting and say “Your question is: Will you marry me?” Definitely make an actual trivia card so that you have the proposal memory to hold onto. PHEW! That was a lot. We hope it helped. If you still need more, check out our oh-so-tear-jerking collection of popular marriage proposals. We also have adorable Disney proposal ideas, tons of Christmas proposal ideas, and then you can watch hundreds of the best marriage proposal videos here as well. As a reminder, we have a proposal idea generator and entire section to help you plan your proposal. 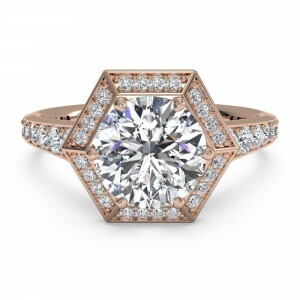 And if you still haven’t gotten a ring, here’s tons of info on how to design a custom ring. And that’s all folks! Best of luck and make sure you share your proposal story with us after.